The memorial is to be found on the main road through Newton Blossomville on the wall of a house facing the church. Private 1439, 8th Division Cyclist Company, Army Cyclist Corps. 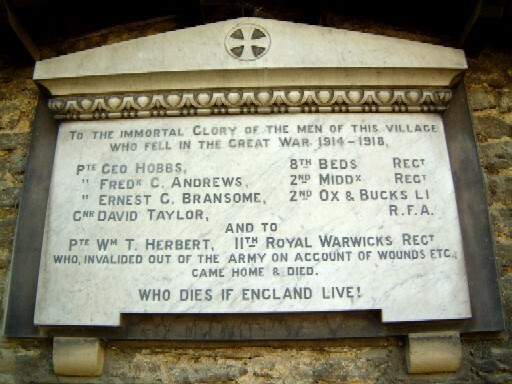 Died of wounds Sunday 14th March 1915 in France & Flanders. Born and resident Newton Blossomville, enlisted Willsden, Middlesex. Son of Mr. J. Andrews, of Newton, Blossomville, Newport Pagnell, Bucks. Formerly 12945, 2nd Battalion, Middlesex Regiment. Buried in MERVILLE COMMUNAL CEMETERY, Nord, France. Grave II. E. 3. [Spelt BRANSOM on CWGC and BRANSON on SDGW] Private 22242, 6th [2nd on memorial] Battalion, Oxfordshire & Buckinghamshire Light Infantry. Died of wounds Wednesday 28th March 1917 in France & Flanders. Age 21. Born newton Blossomville, enlisted Bedford, resident Newport Pagnell. Son of Mary Bransom, of Newton Blossomville, Bedford. Buried in ST. PIERRE CEMETERY, AMIENS, Somme, France. Grave VIII. B. 10. Gunner 219004, Royal Field Artillery. Died Friday 1st November 1918 in Egypt. Age 24. Enlisted Bletchley, Bucks, resident Newport Pagnell. Son of Harry Taylor, of Lodge Farm, Clifton Reynes, Newport Pagnell, Bucks. Buried in DEIR EL BELAH WAR CEMETERY, Israel. Grave B. 220.
WHO DIES IF ENGLAND LIVE!